The River Bain is a tributary of the River Ure, which it joins at Bainbridge in Upper Wensleydale. Its main claim to fame is that it is the shortest river in England. The River Bain emerges from Semerwater, a scenic lake in Raydale, and the river then only has a 2 mile journey down to the River Ure near Bainbridge, making it England's shortest river. The River Bain my be short but it provides delightful fly fishing for wild brown trout that rise feely to your fly. 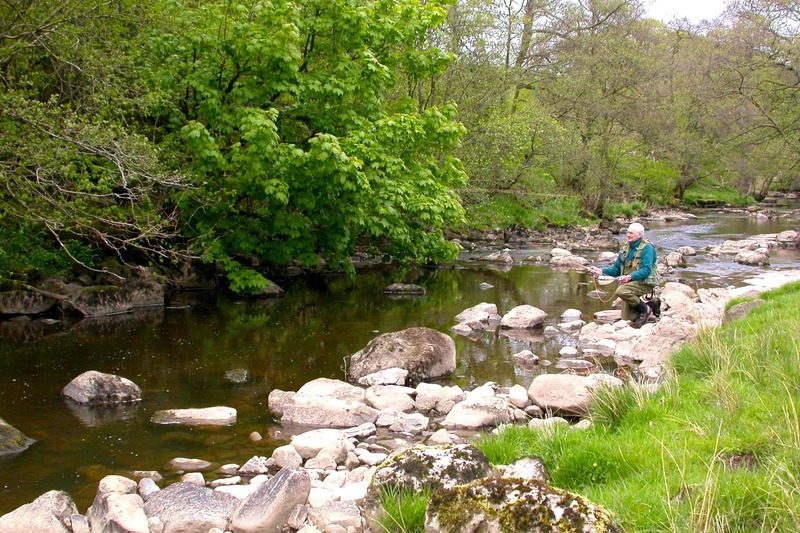 A day's fly fishing on the River Bain is best split in two; between the lower river (from the confluence with the Ure up to the village); and the upper river (from just above the village to Semerwater). The fishing is good both upstream and downstream of Bainbridge, however, the river that leaves Semerwater is very 'canal like' and doesn't offer very good fly fishing for quite some distance downstream, although I have heard that it is very good for coarse fishing. The River Bain is quite narrow and short rods of 7 to 8 feet are best employed with a light line and short leaders. The brown trout of the River Bain are plentiful and usually very hungry. It is rare that they will refuse a well presented dry fly and I have also had success with duo style fishing. I have found that the River Bain fishes better when running quite low, so low in fact that it can look unfishable! But persevere, read the water, keep low, get carefully into the best position to present your fly and success is almost guaranteed. The main feeder beck of Semerwater is known as Crooks Beck and I have occasionally fished up this narrow, interesting, little stream. It never quite lives up to its inviting looks but the surroundings take some beating and there are a sufficient small trout present to make the journey worthwhile. Day tickets are available from the Rose & Crown pub in Bainbridge.